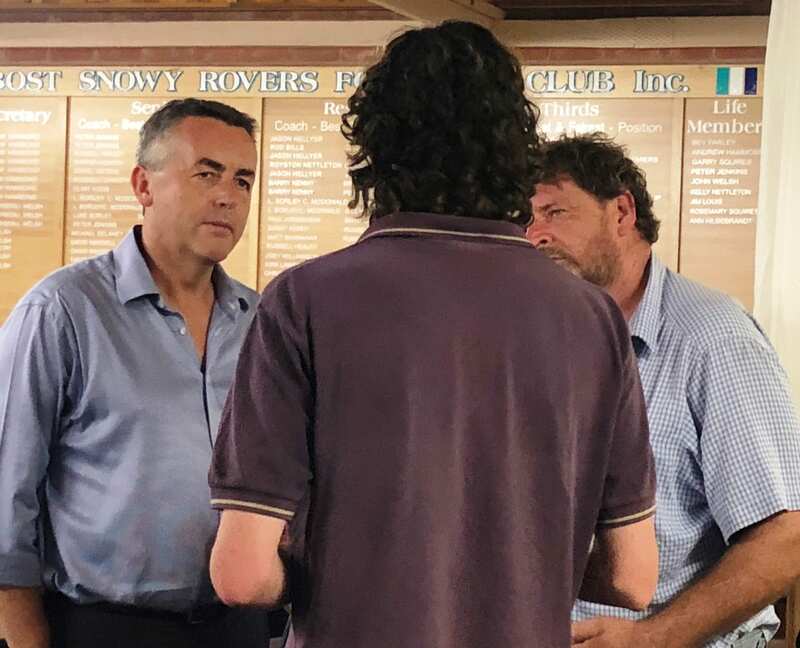 The need to reduce expenses like municipal rates and the cost of feed were among the key issues for drought-affected local farmers who met with local MP Darren Chester and Federal Minister for Agriculture David Littleproud at a community meeting in Orbost on Wednesday night. Around 30 farmers attended the meeting at the Orbost Snowy Rovers Football Netball Club. Mr Chester and the Minister visited local dairy and beef farms on Thursday. “My message to David was we need to do everything we can to support farmers through this drought and make sure they are viable in the longer term when better seasonal conditions return,” Mr Chester said. “It’s important he was able to hear personally from farmers struggling through severe drought conditions and understand the impacts the ongoing drought is having on different parts of the community. “Every drought around Australia is different and while there are some shared lessons that can be learnt, the support measures and requirements of each community can vary. Minister Littleproud’s tour of East Gippsland from Orbost to Bairnsdale was his second visit to Gippsland in a month and follows visits by the Prime Minister and Deputy Prime Minister. “Lessons learned on the ground from visits like this one to East Gippsland will be used to shape further funding announcements and future government policy,” Mr Chester said. Meanwhile, Drought Outreach information sessions for drought-affected farmers will be held across Gippsland next week. Sessions will be held in Omeo, Buchan, Bairnsdale, Orbost and Cann River and also across Wellington Shire. Farmers will be able to speak to Federal and State Government representatives, charities, industry groups and mental health providers about their circumstances and the help that is available to them. Information will be available covering the Farm Household Allowance, the Rural Financial Counselling Service and tax assistance measures. Representatives from the Salvation Army will attend and can provide immediate practical assistance up to $3000 for eligible farmers, farm workers and farm suppliers. “This is a valuable opportunity for farmers to discuss their personal circumstances with the agencies who can help them,” Mr Chester said. Details of the Drought Outreach information sessions are listed below. For more information, visit www.agriculture.gov.au/drought or call 0447 901 396.